Providing fast, reliable connections for a growing city. GEC was engaged to design and coordinate the Bus Rapid Transit (BRT) passenger infrastructure for Calgary Transit’s MAX system, which includes over 100 stations and stops. 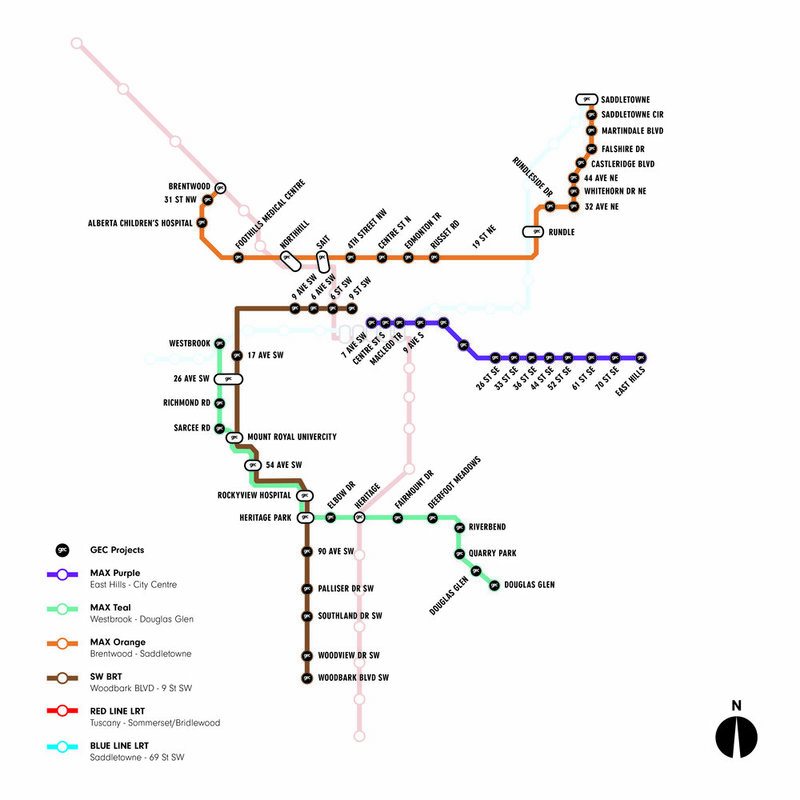 The City’s current BRT network has grown extensively since it was first put forward with the 2009 Calgary Transportation Plan (CTP) and the subsequent RouteAhead strategic framework. GEC completed the station design for the four newest lines – the Southwest and 17 Avenue SE BRT transitways, the north crosstown and the south crosstown BRT routes. The MAX Purple (17 Avenue transitway), MAX Teal (southwest transitway) and MAX Orange (north crosstown) lines commenced revenue service in November 2018. The transitway portions of the MAX network (representing 30 km worth of the system) constitute a nearly fully realized BRT implementation featuring signal pre-emption, purpose-built dedicated BRT infrastructure, and in many locations, dedicated lanes, shoulders and rights-of-way. In addition to improving commuter service between downtown and the City’s southwest and eastern suburbs, a major goal of the BRT network is to improve multi-modal crosstown connectivity by providing users with new rapid transit options to connect communities with major destinations without having to go through the city centre (a necessity with The City’s light rail system). The City estimates daily ridership of around 30,000 people following the initial five years of operation. Parts of the transitways are rail convertible so that they can be upgraded to LRT or streetcar service in the future. Each of the stations consists of a low-floor bus platform (to accommodate level boarding) and they feature an easily recognizable design that is unique to the MAX system and its brand. The stations were designed to complement and enhance the adjacent communities and public realm in terms of scale, level of amenity, and urban design. GEC developed a ‘kit of parts’ that would allow the stations to be scalable. This approach allows the system to maintain a distinctive architecture that can also adapt to a range of urban contexts and intensities in an efficient and cost-effective way. Station components, such as the canopies and support elements were pre-fabricated as smaller modules that could easily be repeated to suit the requirements of each location. Site-specific and in-situ elements were also provided where necessitated by particular conditions. Common branding elements, electronic signage, and shelters are common to all stations, but amenities vary significantly as required.